Transfer benches are simple, easy-to-use tools that ensure showering and bathing are safe for those suffering from mobility issues. Bariatric benches are a good option to choose when you need shower benches for heavy people. These heavy duty benches are durable, safe and can be beneficial for anyone who needs assistance when showering or when entering into a bathtub. The most common reason that you may choose transfer benches for the home is because of limited mobility or trouble moving. Arthritis, surgery and many other conditions can cause bathing to become a major problem. Shower benches for heavy people are designed to bring an element of both safety and comfort to showering, allowing you to become more independent. Bariatric transfer benches often have a weight limit of about 450 pounds or more, allowing them to be used as a safety device for people of all sized. The heavy duty transfer benches come in several different styles, but will usually sit inside the tub. If you need assistance getting into the tub then you can also choose from bariatric transfer bench models that have one section outside the tub for easier access. Be sure to install bariatric grab bars near these benches for extra support when getting into a bathtub. Your bariatric bench will also be made from easy to clean and care for plastic and stainless steel. The plastic is durable enough for the heaviest people while also being comfortable enough for daily use. The curved seat design ensures you are secure, while many models also offer an arm bar to ensure you won’t slip off the bench inside the tub. Purchasing a bariatric bench is very affordable. Many models are available for less than $100 while still offering the comfort and safety features you need to bathe independently. Shower benches are the perfect option for elderly or disabled people who don’t want to depend on other for their bathing needs. With just minimal assistance you can easily navigate the shower on your own. Bariatric Shower Chairs – Supports weights up to 550lbs. Chair legs have suction cups to keep it from slipping and it only weighs 3 lbs. 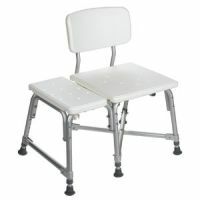 Has a backrest too and X brace for supporting extra weight. These are simple safety shower seats for obese people. 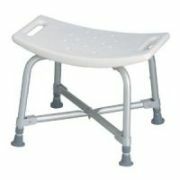 Bariatric Transfer Benches – Has 1 inch spacing in the seat for shower curtains. Supports up to 550lbs. Has suction cup legs to secure position on bathroom and tub floor.